For they are us, our bodies only wilted leaves on the tree of life." In his 95th year and fighting fit to the very end, Denis was the longest living Gallagher in his family. We hope to follow his example. Dad made this world a better place for his family, friends and his communities. His brilliant smile, warm handshakes and caring nature will be missed by all those who knew him. The family sends special thanks to all the staff at Wentworth Heights, particularly those on the Emma and Egerton wings, and to the staff at Shalom Village in the Goldie's programs, for the kind and compassionate care both our parents received over the past few years. Linda (Colin), Lee, Lorene (Drew), Les, and families. In lieu of flowers, donations to The Alzheimer's Society, Juvenile Diabetes or The Royal Canadian Legion foundations would be greatly appreciated. 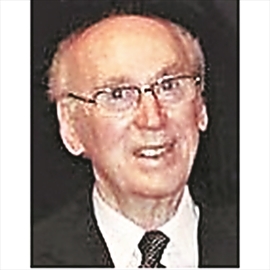 Celebration of Life service at Cresmount Funeral Home, 322 Fennell Avenue East, Hamilton on Tuesday, February 19, 2019, Visitation at 10:00 a.m. followed by service at 11:00 a.m. Reception to follow service.